It is always very sad to come to the end of a project so close to one’s heart, but at the same time I have come to realise that the Waterloo Archive series, of which I am very proud, has now run its course. This is not to say that the contents of this final volume are by any means less interesting or important than those published in previous volumes. Indeed, the amount and quality of the accounts I have crammed into this final volume make it a particularly strong one. It is also far from true to say that all that is undoubtedly out there is now published; for despite intense searches of the regimental museums and archives of Britain, the Commonwealth and of the United States, I know that there is probably more still to emerge from un-catalogued archives and I have no doubt that there is certainly more to be revealed by families, who continue to preserve with great pride, the letters and journals of their forebears that fought and sometimes died at Waterloo. It is still my great hope that next year with the commemoration of the two hundredth anniversary of the campaign, that many of these families will finally allow us to share these riches. 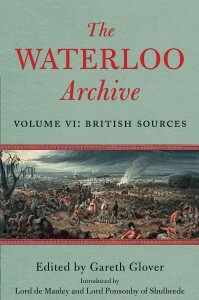 However, my original aim of drawing together from numerous disparate sources, the memories of as many individuals as possible has I believe been very successful and I hope that the Waterloo Archive will become a focal work on the campaign and form an invaluable resource for researchers for generations to come. It has brought together no less than three hundred such memories, mostly written within days of these occurrences, before the dreaded hindsight had the opportunity to influence their thoughts. If I have any regrets, it is that the series did not eventually cover the Dutch, Prussian and French sources as originally conceived, but initial approaches to fellow enthusiasts in these countries either failed to persuade them to volunteer the admittedly hundreds of hours of commitment required to achieve it; or the draw of more lucrative offers (although ultimately illusory) turned their heads towards other projects. But what treasures await the reader of this volume? Out of the seventy five correspondents featured in this volume, no less than thirteen come from the lower ranks, a creditable number, given that many of these lower ranks were supposedly illiterate or nearly so. I have touched upon this subject previously, but it is clear from the evidence produced in the Waterloo Archive, that literacy rates were undoubtedly climbing amongst the common soldiers and that the greatest common denominator apparent in this improvement was the rise of non-conformist churches and the associated rise in lay preaching. Their honest, unvarnished, direct approach is both refreshing and instructive, once we look beyond the rumour and fireside bravado which invariably creeps in, the honesty regarding their own actions and those they witnessed are of real worth. Here there is no guarded and diplomatic version, no whitewashing of errors or reluctance to apportion blame where it is due. Having said that, a good number of the letters from officers and even senior officers, written directly to family or colleagues at home for private consumption, although unlikely to highlight their own failings, do freely apportion blame on others, particularly their seniors. A number of letters appear in the volume from members of the Staff of the army, but of particular interest are two letters written late in life by Captain Shaw Kennedy Assistant Quarter Master General which reveal for the first time that immediately following the Battle of Waterloo, and because of a poorly worded report by General Count Alten, the Duke of Wellington was led to believe that the near collapse of his centre in the late afternoon was the entire responsibility of Count Kielmansegge. It is now clear that on the march to Paris, the poor Count was ordered to place himself under arrest and it took the direct intervention of Shaw Kennedy and others to convince the Duke that the report was wrong. Kielmansegge was released and reinstated quietly before the army reached Paris and the whole incident hushed up until now. The letters of Captain Kelly of the Life Guards provide his detailed version of the combat at Genappe and at Waterloo, from which it is clear that he believed that he was not appropriately recognised or rewarded. In comparison Corporal Coulter of his regiment vividly describes his own wounding during the battle in simple terms and his survival was the only reward he craved. Lieutenant John Hibbert provides some clear evidence that at least some prisoners were killed by the French as they retreated and Henry Lowther states something similar, whilst providing second-hand information regarding the death of Major Hodge at Genappe. Regarding the role of the Scots Greys there is a great number of witnesses providing further evidence in this volume including a rare follow up questionnaire from William Siborne, which is not in his files at the British Library. Lieutenant Ingilby’s journal provides a long overdue description of the role of Gardiner’s Troop of Royal Horse Artillery at Waterloo and the constant look out for the approach of the Prussians. Lieutenant Colonel James Stanhope give a full and clear account of the role of the 1st Foot Guards on the ridge line and makes some very interesting remarks regarding the actions and indeed the honest comments made by both the Duke and the Earl of Uxbridge during the battle. Sir Andrew Barnard also makes a very honest confession regarding some of the 95th Rifles fleeing to the rear when charged by the cuirassiers. But those of the Support services included in this volume are also of great interest. The letters of Captain Oldfield and Lieutenant Sperling highlight the preparations ordered to fortify posts at the entrance to the Forest of Soignes to keep the roads open in case of retreat and the abject failure of the engineers to provide these defences. Storekeeper James Robins reveals that French cavalry captured large amounts of stores on the Nivelles chaussee on 17 June; and Commissariat Tupper Carey describes the confusion in the rear, but also reveals that the Brussels chaussee did remain open for the advance of ammunition convoys throughout the day. Lieutenant Hildebrand at Hal indicates that there was some skirmishing in the vicinity and also reveals that they were aware of the battle from various reports brought to them during the day, although they did not hear it. Edward Heeley gives an insight into the life of a servant boy accompanying the army and triangle player John Scott describes his experiences with the Black Watch during the battle, as the young son of a soldier. This wide ranging and eclectic mix gives us a real feel for what it was like as an ordinary soldier fighting and marching across Belgium during this campaign. Whether serving as a junior officer, a mere private or simply a young lad following the army, they all suffered equally together and every survivor, no matter their rank, saw their fellow survivors as the lucky few, which formed a bond of comradeship that they maintained until the grave. To sum up the Waterloo Archive series, I hope that these 1,500 pages of letters, memoirs and journals have given the human story of the Waterloo campaign and generated a greater interest in this pivotal campaign in European history. If so, then I have achieved my original aim and I am satisfied. The accounts I have published in this series, along with the publication a decade ago of the remainder of the Siborne letters has uncovered over five hundred new witnesses to the battle and they have radically altered our understanding of many aspects of the battle and indeed of the campaign. It is therefore high time, despite the plethora of previous accounts of the battle, that an updated account of the Waterloo campaign is produced which incorporates all of this new material. I have chosen to take on this task as a natural progression following on from the success and revelations of the Waterloo Archive series. This new history will be published by my good self in the very near future entitled Waterloo- Myth and Reality. This it is hoped will put the record straight and banish many myths that have evolved over the centuries. I therefore hope dear reader that you will continue to follow me on this fascinating journey for the truth.